Birmingham is home to many conferences every year in a variety of fields in marketing, business, management, and related fields. These conferences are not always held in Birmingham, but this city is famous for its event sites and conventions that take place throughout the year. This conference takes place in the Birmingham International Convention Centre (ICC), which is located in the city centre and is very easy to reach using public transport or private vehicle. The ICC is home to many conferences, and has a range of halls and rooms located at the venue that are appropriate for conferences of any type. The venue can hold thousands of people at a time, with the largest hall being able to accommodate 3000 people at once. The conference fee includes attendance at all sessions, access to the exhibitions, hotel accommodation, refreshments, meals, wine reception and after-dinner entertainment. There are also catering services available for about 2000 people. The conference, while intended for education professionals, is focussed entirely on promoting, understanding, and building leadership skills. These are transferrable for any industry and it can be a good idea to attend. This conference has also been held at Birmingham at the International Convention Centre. It is focussed specifically on issues dealing with businesses in Wales or Welsh people trying to get into business and entrepreneurship. The aim of the conference is to discuss all of the problems facing this minority in the business world and ways to succeed in marketing and other similar areas. The conference includes refreshments, lunch on both days, an annual dinner, and overnight accommodation. The HR Directors Summit has been held in Birmingham several times and will likely be a venue in the future as well. This annual conference features keynote speeches from leading experts within HR, which allows you to see how the best companies are dealing with hiring issues. 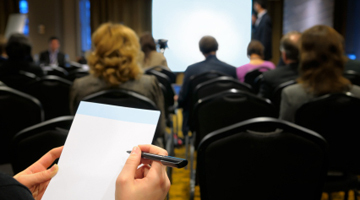 Content at the conference is delivered through a variety of media, such as workshops, master classes, case studies, and even a showcase theatre. Industry experts speak at this conference from a range of high-profile international companies such as Coca Cola, Nestle, and Time Warner. In its entirety, the conference brings together over 1000 HR directors from all over the world to discuss the best type of marketing, business, and recruitment plans for their companies. The Annual UK Trade & Export Finance Conference is held in Birmingham. There are usually over 250 delegates from mainly British businesses. The conference attendees come from the corporate, trading, banking, financing, government, insurance, legal, and consultant industries. The experts that attend this conference focus on creating a high level discussion and debate about how best to manage the UK's corporate, government, and financial sectors. Attendees will stay at the Hilton Birmingham Metropole and will also be well-taken care of with accommodation, full conference facilities, catering, and refreshments. The BABC has been held in Birmingham before and unites many business people from Britain and America who have Trans-Atlantic partnerships set up. Many of the keynote speakers, events, seminars, and workshops at the conference focus on creating sustainable business and marketing networks that are long-lasting. The links between British and American businesses are discussed and systems described whereby entrepreneurs can achieve success. The conference focusses mainly on critical growth in key business areas and with its events discusses the various strategies that entrepreneurs can employ to achieve organic expansion and success in their business. The Annual Rotary International in Great Britain & Ireland (RIBI) Conference has been hosted in Birmingham before and is a frequent venue. Birmingham is an ideal location for Rotarians to hold a conference because of its historical links with business and guilds. Birmingham is one of the oldest and best cities in the UK for starting up a business and there are many resources available. This conference is often the first step for many people to make contacts and begin their network. The conference is held at the International Convention Centre, which can accommodate thousands of people in its rooms, halls, and reception areas. The conference regularly features some of the leading business figures in Britain as keynote speakers, and many other industry specialists and experts who can help attendees with specific advice relevant to marketing their business and becoming an entrepreneur.